One of the unique ways we can look at market sentiment is to track the number of shares outstanding in market ETFs. 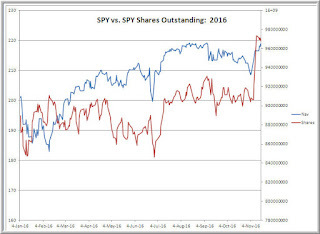 When there is demand for the ETFs, such as SPY depicted above, we see net share creation. When supply is dominant, we see net share destruction. Notice how, for the first half of the year, we had rising prices but little net share creation. That changed off the late June lows with significant share creation accompanying the momentum move higher. When we pulled back going into the election, there was little net share destruction. 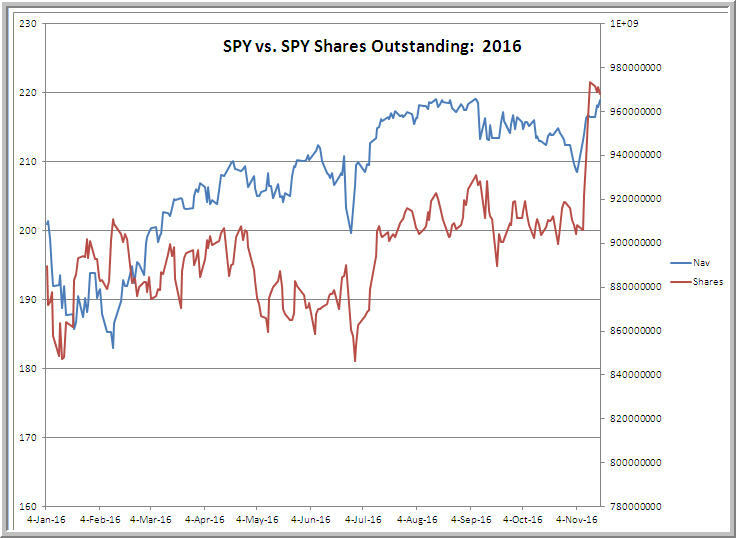 Now, in the wake of the election, we've once again seen an explosion in share creation and a momentum move higher. As you might expect, net share creation has exploded in the financials ETF (XLF) and industrials ETF (XLI), rising over 30% since the beginning of November. Over that same period, we've seen net share destruction in the utilities ETF (XLU), reflecting the move out of higher yielding stocks in the face of the bond market decline and higher rates. (All numbers from the State Street site). What I find interesting is that the share creation in SPY--the market overall--more closely resembles the pattern of the strongest sectors, not the weakest ones. That suggests that it's not just sector rotation impacting the market, but actual net dollars being put to work in stocks.